Washington, Jan 1 : Swiss tennis ace Roger Federer is reportedly banking on his new racket to boost his chances to top the tennis rankings again after he made a winning start with his new equipment on Tuesday in the Brisbane International. The 17-time Major champion paired with Nicolas Mahut of France to beat top seeds Jean-Julien Rojer and Horia Tecau 7-5 7-5 in a men's doubles match at the ATP tournament in Brisbane. 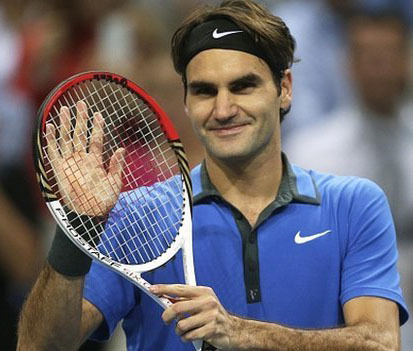 According to CNN, Federer used a larger 98-inch racket head against the previous 90-inch one during the doubles game after trialling it in Dubai during his off-season and will now use it for a title at the opening grand slam in Australia in two weeks time. The report mentioned that Federer's big test with the new model will come in his opening singles match against Jarkko Nieminen of Finland on Wednesday although he did dabble with a larger racket last summer after losing early at Wimbledon.